What sounds like happiness more than a whoopee pie!? Just saying it makes your mount turn up into a smile. Soft cake like cookies sandwiching a sweet often gooey, marshmallowy frosting. uhhh... yes please. Growing up in New York, we would often take trips to Pennsylvania on the weekends and up to Maine over the summer and both are known for their whoopee pies. Traditionally they are rich chocolate cakes with a sweet marshmallow creme filling. They reminded me of another devilish snack cake- also a favorite, but I digress. But as good as that is, I wanted to try something different. And being that it's finally June (although in NY it sure feels like April), I present to you, Roasted Strawberry Almond Whoopie Pies! My kids LOVE berries. And I mean love them. They eat them everyday at breakfast, they'll fight over them if I leave a bowl out. We have to count them just so they each get the same amount. But I could be complaining about worse things. They could be fighting over pixie sticks or caramels! Roasted strawberries seem to be everywhere! And it made me so mad! I roast nearly everything else, why haven't I ever thought to do that with strawberries!? So I figured the tang of the strawberry would cut the sweet of the marshmallow cream in the center of these whoopee pies. I also added almond extract to the cake, being that I love almond (I'll seriously order anything with almond in it) and it's a nice complement to the strawberry. 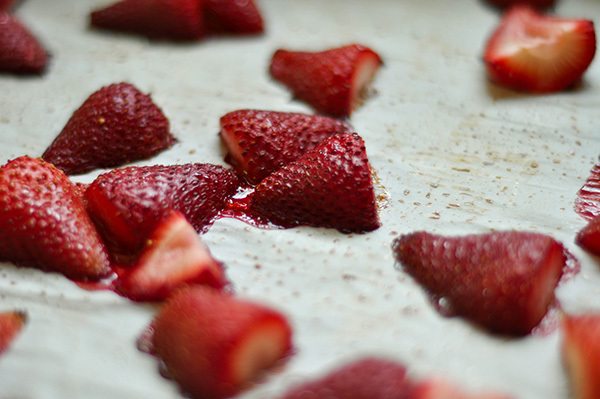 I began by halving the strawberries and added 1 tsp of sugar. Roasted them at 400F for about 15-18 minutes. Then pureed them in a food processor and set aside. This stuff is hard to keep away from the kids, but I tried my best! So the cookie starts off with a cake like batter. Beating butter and sugar together till it is light and fluffy, then adding in the eggs, almond extract, dry ingredients and ending with the buttermilk. I decided to make some of these funfetti by adding 2 tbsp of rainbow sprinkles to half the batter. They were so cute! And the kids loved it! Once they were baked. I started on the frosting. A basic buttercream is whipped together with marshmallow creme giving it a fluffy texture. Once I was ready to marry these together, I filled two small disposable pastry bags, one with the marshmallow frosting and the other with the roasted strawberry puree. Put them both into a larger pastry bag fitted with a star tip and piped a marshmallow strawberry swirl of half of the cookies. 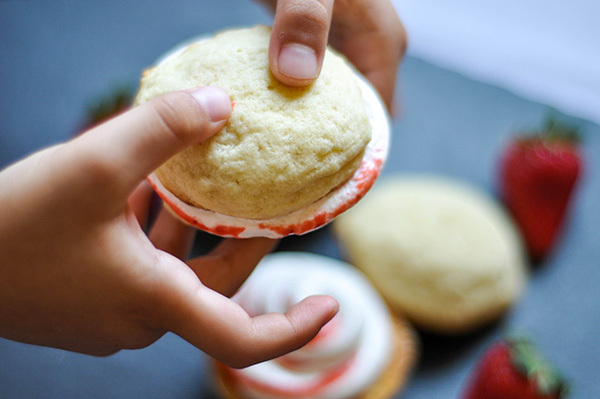 Smoosh them together and you have a whoopee pie reminiscent of your favorite Italian cookies! Soft almond flavored cake and sweet and tangy frosting. My husband actually ate a whole pie or two! (This is a coup because he normally would rather reach for a bag of chips or stale bag of oreos- seriously... I can't for the life of me explain why!!) As for the kids, it was the roasted strawberry that was the ultimate winner. Watching the dual colored creme ooze out of the sides as they took a bite was adorable. Well adorable for a second because I had to wipe up that mess. But they loved every minute of it. 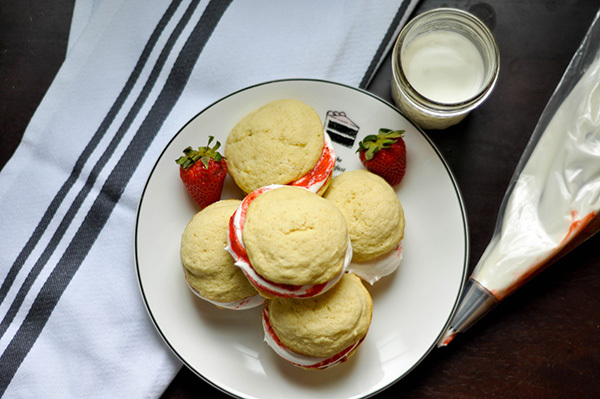 Roasted Strawberry Almond Whoopee Pies are a definite winner in this house and totally fun to eat and make! Add eggs and almond extract and beat till combined. Using a medium sized cookie scoop, scoop the batter onto parchment lined cookie sheets. Place about 3 inches apart to give them enough room to spread. Bake for 13 minutes or until golden brown on the edges. Allow to cool. To make the filling. Combine strawberries and sugar. Place on a baking sheet and roast at 400F for 15-18 minutes. Once cooled, place in a food processor and puree till smooth. Set aside. Beat butter till smooth, then add confectioners sugar and vanilla. I wanted a swirled look so I placed the frosting and strawberry puree in separate small piping bags and placed them inside a larger bag to create the effect. Pipe or spread the filling onto the cooled cookies and sandwich them together and devour!